Now if you start idea.exe, it will use the specified JDK instead of JetBrains Runtime. Note that you may need to logout/login for the new environment variable to take effect. The "JB SDK Bintray Downloader" is too old, the jdk it downloads it not working for current IDEAs ( 2018.x ), my idea can't start after using it. Any plans to also provide a patched jdk 11? "Unable to compile for target level 11. Need to run IDEA on java version at least JDK_11, currently running on JDK_1_8"
Same as above.. When is the Stable Java11 release coming? Currently when Idea is started with the latest early access version of Jdk11 i.e. jbsdk11b125, a few things do not work. Please report IntelliJ IDEA 2019.1 + JetBrains Runtime 11 issues at https://youtrack.jetbrains.com/issues/IDEA. It's work in progress. We'll release IntelliJ IDEA 2019.1 with 2 download options: JetBrains Runtime 8 and JetBrains Runtime 11. You'll be able to choose which one works better for you. Once all the major issues are resolved version 11 runtime will become the default. I will try with 2019.1. -> Tried in 2019.1 as well. It does not work. 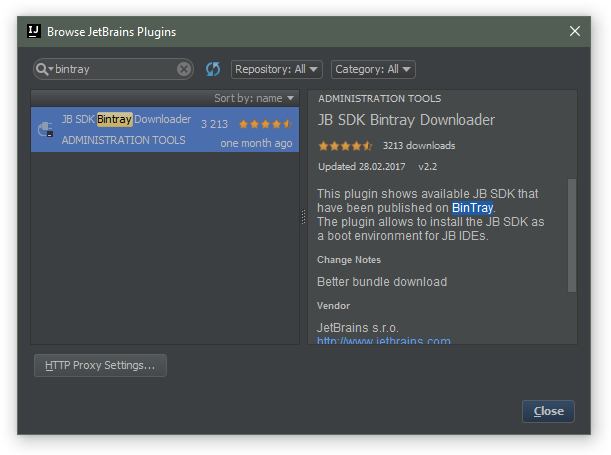 The fixes specific to JetBrains Runtime 11 are made only for 2019 version. I don't recommend using JBR 11 with IntelliJ IDEA 2018.3. 1. Will 2019 Idea have both jdk8 and jdk11 bundled with it? Or to use JDK 11 as the boot JRE, one has to follow the above process? 1. We are providing both versions depending on the download, see https://www.jetbrains.com/idea/nextversion/ . 2. As far as I know, it's not planned. One can use https://docs.oracle.com/en/java/javase/11/tools/jlink.html to build application specific runtime. The path to java executable is different in these as compared to the earlier jbre8 versions. Not sure where this should be fixed. In Gradle or in the plugins which are calling the Gradle getExecutable() method or it is something to be taken care of on your side. Please submit a ticket at https://youtrack.jetbrains.com/issues/JBR. 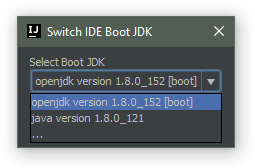 I was super excited to see that IntelliJ Idea 2019.1 was released but went looking for the Java 11 boot JDK version and I don't see it? The one that I see has the Java 8 boot JDK. So I had to follow these steps and download the JB Ideas Java 11 boot JDK and install the plugin in 2019.1 to switch over? What's the deal? Why isn't there a 2019.1 Java 11 book JDK download available like there was a during the EA cycle? Which environment variables in which order are used to determine the JDK used to run the IDE? On my Mac running Mojave (OSX 10.14.3) , even though i downloaded IDEA 2019.1 with bundled JDK 11, it will always start using JDK 8. I do set JAVA_HOME and JDK_HOME in ~/.profile but even if I unset those in a terminal and start IDEA from command line, it uses JDK 8. You probably have idea.jdk file in the IDE config directory overriding the bundled JDK. These environment variables have lower priority than idea.jdk file. @Serge Thanks for the reply and yes, I do have a idea.jdk file but it points to '/Applications/IntelliJ IDEA.app/Contents/jdk'. Try removing it, you don't need to specify the bundled JDK explicitly. 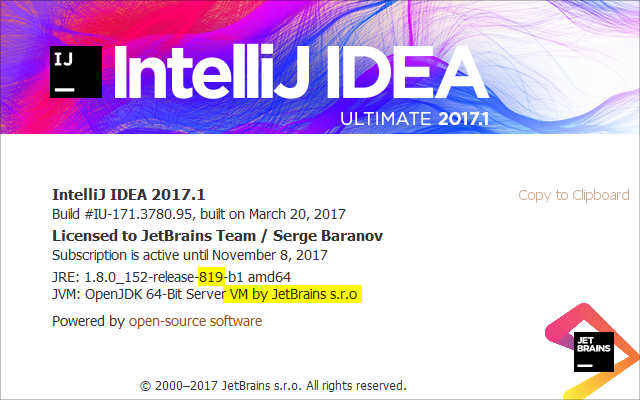 Does the reinstall from http://www.jetbrains.com/idea/download/index.html help? It could be that bundled Java is broken in your current installation (in /Applications/IntelliJ IDEA.app/Contents/jdk). No, a reinstall did not fix the problem. The app bundle signature is valid according to the command provided by you. Out of nowhere, the other JDK versions are not even found. I might have to add, my file system is case-sensitive, which is not the default for Mac, but should not be a Problem. https://youtrack.jetbrains.com/issue/JBR-1360 might be the case then. It should be fixed in https://confluence.jetbrains.com/display/IDEADEV/IDEA+2019.1+EAP. Thank you very much. The EAP version indeed uses the correct JDK.